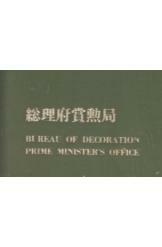 Decorations of Japan, Medals of Honour and Silver or Wooden Cups, album format, 20 pages. TOC: Supreme Orders of the Chrysanthemum; Orders of the Rising Sun; Orders of the Precious Crown; Orders of the Sacred Treasure;Order of Culture; Medals of Honour, Silver Cups and Wooden Cups. Each order on a full page color photograph.